If you're a Mac user with an Android phone, some apps on your computer aren't very useful, such as Messages, which is meant to work and sync with iOS devices. But now, thanks to MDRS, LLC, using the Messages app on your Mac with an Android phone is now possible and easily achievable. Plus, we've got 50 promo codes to give away for a free year of service! 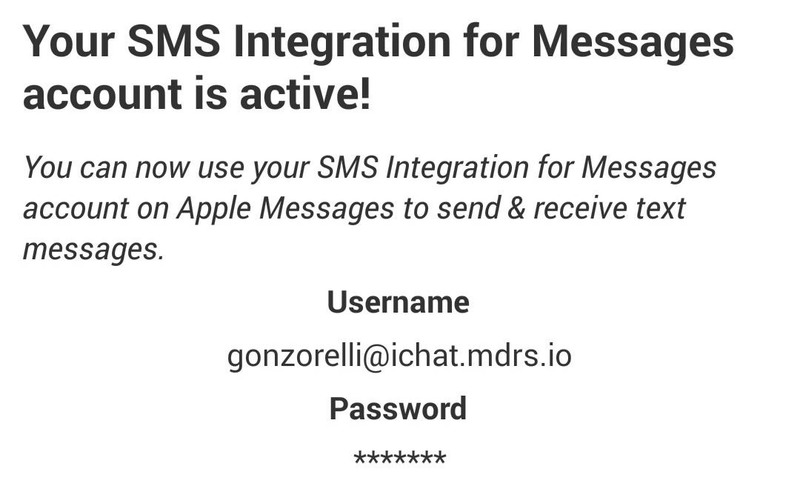 SMS Integration with iChat for Android is different than apps like MightyText and Pushbullet since it provides native integration with Mac OS X, which means you'll get all of your SMS texts from Android in the Messages app on your Mac, and you'll be able to reply to them from either platform. The app is free to install and use, but you're limited to only 5 messages a day. To unlock the full version, there's an in-app purchase for $12.99/year, a pretty reasonable price if you're going to be chatting from your Mac a lot. In order to function properly with Messages, the application requires you to create a unique SMS Integration for Messages account that will be able to be added to the Messages app. To do so, simply open the app and follow the two-step prompt. 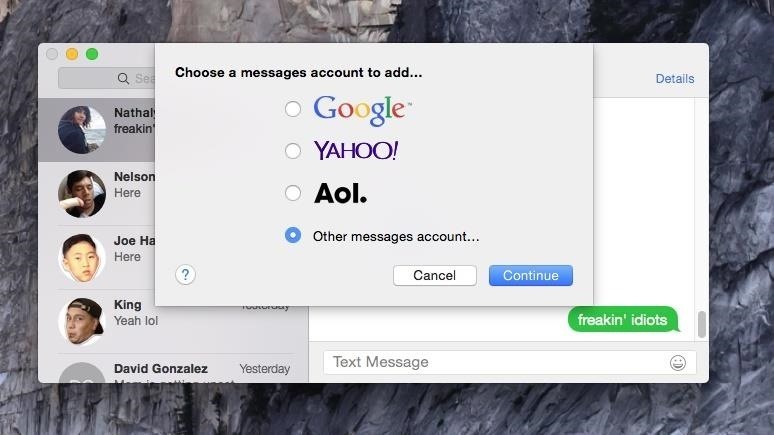 Now, in the Messages app on your Mac, select "Add Account." When you're selecting the type of account, choose "Other messages account," then hit "Continue." 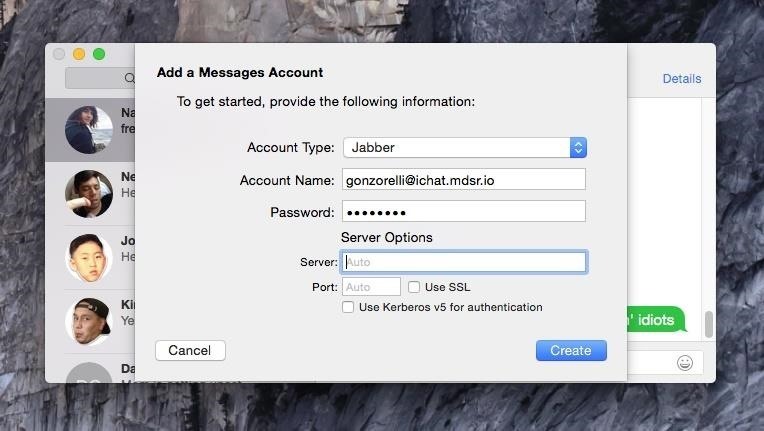 For the account type, enter "Jabber," then input the account name and password you created in the SMS Integration app. Leave the Server and Port options blank, then click "Create." Since the app syncs the information on your Android device, you're able to draft a Message and input a contact you have on your phone. Additionally, if you have a contact image, Messages will include that as well. 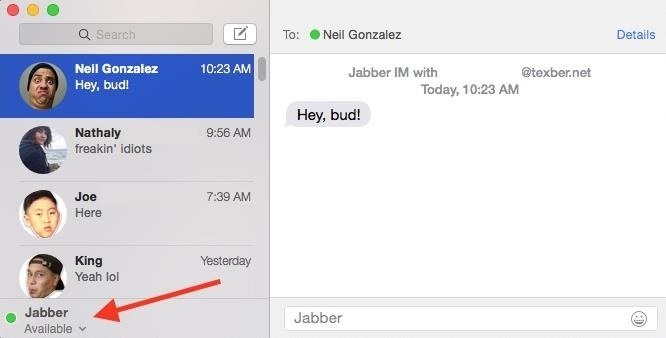 To see if you're indeed connected, the Messages app will show that the Jabber account is "Available." Indeed it is. Though you may get a notification that states the servers do not match, it is only due to the fact that the developer is using the server from his other application, Textber. He's working on cleaning up this issue and also confided to Gadget Hacks that security is a top priority and that "all communication between the computer, servers, and user's phone is encrypted, and we do NOT collect any personal data from the users." UPDATE: Certificate mismatch issue has been resolved! While chatting with the developer, he also stated that they're working on MMS and Group Chat support, so look forward to that in the future. However, note that this will not work with Apple's native iMessages—only text messages. While $12.99/year for service is reasonable, the developer has provided Gadget Hacks with 50 promo codes that are good for a free year of service. To win one, simply comment below, letting us know what Android device you plan to use SMS Integration with, and follow us on Twitter at either @GadgetHax, @AndroidHacksCom, or @AppleHacksCom. UPDATE: The giveaway is now over, but if this functionality is useful to you, definitely think about making the purchase. Once you've commented and followed, we'll shoot you a private message with your promo code. Once received, simply open the SMS Integration app, choose the "Subscribe" option, and enter the code. Your promo code is on the way. Following!!! my twitter is @octaviolpz and i will use the app in a Sony Xperia Z3. Thanks! No problem! Your code is on the way and be sure to let us know what you think of the app! Done, and gonna use that app on my G3 :) Thanks a lot and appreciate that mentioning and thought about the security part in the video! We appreciate that! PM with promo code is on the way. I was looking for this for a long time! My device is a LG G2 and I hope I can win this! Amazing guys! Just sent your promo code over. Samsung Note3 With my retina Macbook Pro. Man will this ever be nice. Just sent the code over. Hover over your name in the top-right, then click on the mail icon to see your inbox. It's there. Would love to try this out! Been looking for just this functionality. I'd be using this with my LG G3 VS985, running 4.4! Awesome! Your code is on the way. I have Galaxy Note 4! Twitter folow ok! Following all three accounts via @SayItWitMyChest :-) Thanks! Thanks! Your promo code is on the way. I would be installing on a Moto X. @vladtepish (me) is now following all three requested accounts. :) Thank you. Let us know how it works on the M preview. Code is on the way. I'm sending a code over. I would certainly love to try this out with my Samsung Galaxy S4 on Sprint. Let us know how you like it. Code on its way. Would be great to get a code and use this to keep in touch on my Nexus 5 with my ambi-system-dexterous family! Following AndroidHacksCom @grshaner! Cool, code is on the way, enjoy! Plan to use it on my HTC One M8. Sending a code your way now. This looks class. My Twitter is @benfishwick and I plan to use this on a Galaxy S4 Google Play edition. Haha no need to go that far! Your code is on its way. Appreciate it. Code on its way! i don't know if its too late but i would love to use this with my new macbook and my zte z max! Followed @gadgethax and @AndroidHacksCom from @donodonzee. Would love to be able to use this from my Moto G and hope it's not too late! Not too late. I'll send you code shortly. Followed via Twitter. Going to set this up on my Samsung Galaxy now! Sweet! Hi there, Faisal! There are two awesome techie gals here waiting for giveaway codes, if you get a moment in the next few days. Myself and user Jeanette Folkes anxiously await a spot in the 50 person code list! Thanks a bunch. Hi ladies. I'll send the codes over to you now via private message. I've followed all three accounts and I really hope that I'm not too late to get the promo code. I'm using a Moto G and MBPr. We really appreciate the follows, but sadly, the giveaway has ended. Sorry! Is the code still available ? Works great, I am using my Galaxy S6. Any more codes up for grabs? Im using the Galaxy s6 too! How can I obtain a code? and does this promo code provide a discount? And my final question is how do I actually buy the app feature of texting from my mac unlimited amount of times? The codes were for an old promotion, and there are no longer any to give out. Sorry. All purchases can be made in the app on your Android phone. watched the video on the Play store and would love a promo code to use on my Moto G. thanks. plan to use on nexus 5X please send promo code. I will follow on twitter. i plan on using this app with my Note 8 and my macbook pro. Also followed all 3 twitter accounts. I use a Samsung 7, please send me the code so I can use on my first macbook... TY. Really excited to see just how well this works. Looking forward for the promocode! New Samsung S9+ - Very excited to see how I can message using my Mac as I could with my iPhone. Thanks for the info, great site!